Isle Royale is possibly the best backpacking destination in Michigan, and one of the best in the eastern part of the country. The isolated island, with very limited permanent human presence, covered by a wide expanse of northern wilderness provides a unique and memorable backpacking experience. Since its great distance from major cities and freeways, it does not see huge number of visitors. Therefore, you can go there and “get lost” in the wilderness, if you choose so. 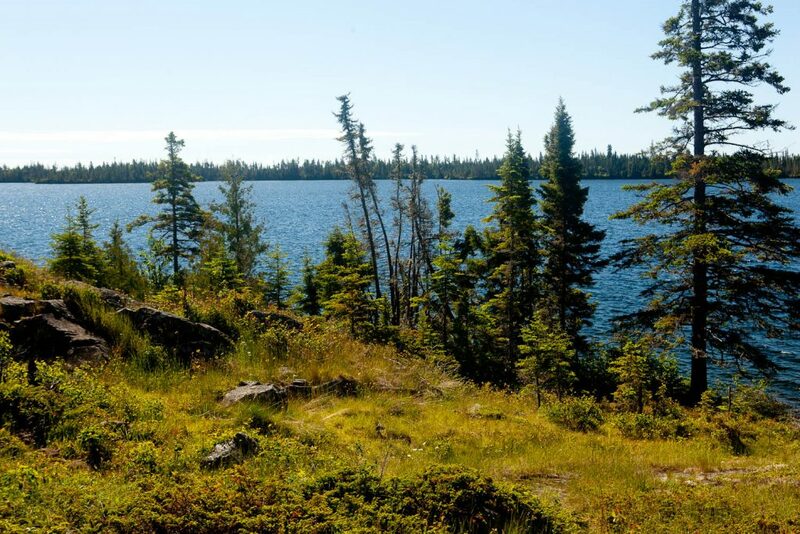 In early July 2018, I went to backpack on Isle Royale for 5 days, visiting some of the more popular campsites. Isle Royale Queen IV at the dock in Copper Harbor. 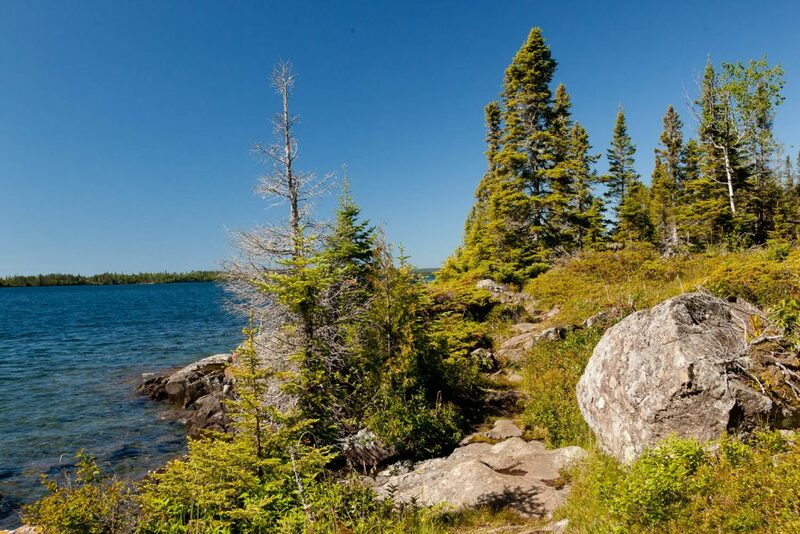 Isle Royale is probably the most remote national park in the eastern part of the country. For those of you who don’t know, the island is located in the northwestern part of Lake Superior. Actually, closer to Canada than States. 418 miles from Minneapolis Saint Paul International Airport – about 7 hr. drive. Then from Copper Harbor, you need to take a ferry to the island. Another 3 and ½ hours. There are some other options. Like flying to Marquette. From there the drive to Copper Harbor is only 155 miles and takes only a little over 3 hours. 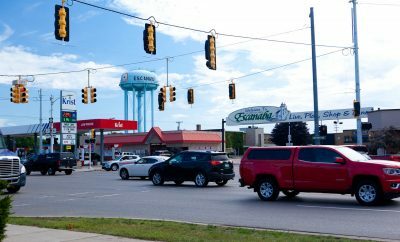 (Read my post about direct flights to northern Michigan here). You can also choose to take a ferry from Houghton, which saves you about 46 miles, or an hour of driving. However, then your ferry ride will take 6 hrs. If you are coming from Chicago, or Minneapolis, you can take a ferry from Grand Portage, MN. However, again, the drive from Chicago to Grand Portage is 600 miles, and takes about 9 and ½ hrs. Then, there is an option of taking a sea-plane from Houghton, MI, which would save you some time, and also provide you with an unforgettable experience of seeing the island’s incredible landscape from the air. So, as you can see, there are many options how to get to the island. Therefore, the logistics of getting there can be complex. You need to consider how much time you want to allow for travel there, your costs, and also things like seasickness, if you consider taking a ferry. Islands on the opposite side of Rock Harbor. 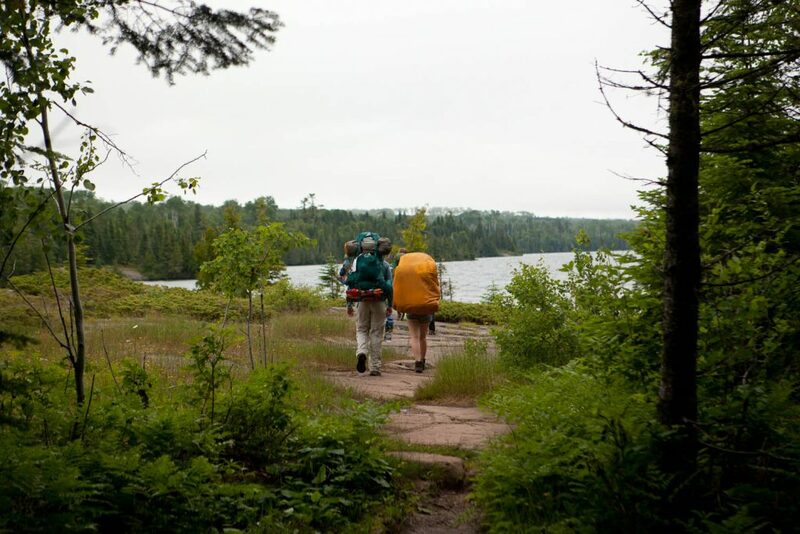 The Isle Royale National Park is open from April 16 through October 31. So, you can visit the park in spring, summer or fall. There are advantages and drawbacks for going during each of these seasons. Spring will be cold and you probably will see some frost and snow. However, there are no bugs and there are very few other visitors on the island. When you go in late June/early July, you will have a mild weather with temperatures during a day around 70 -80 F (21 – 27 C), and 40-60 (4 – 15 C) – at night. Unfortunately, you will have to deal with some mosquitoes and there will be more tourists on the island. You can also expect frequent rains. 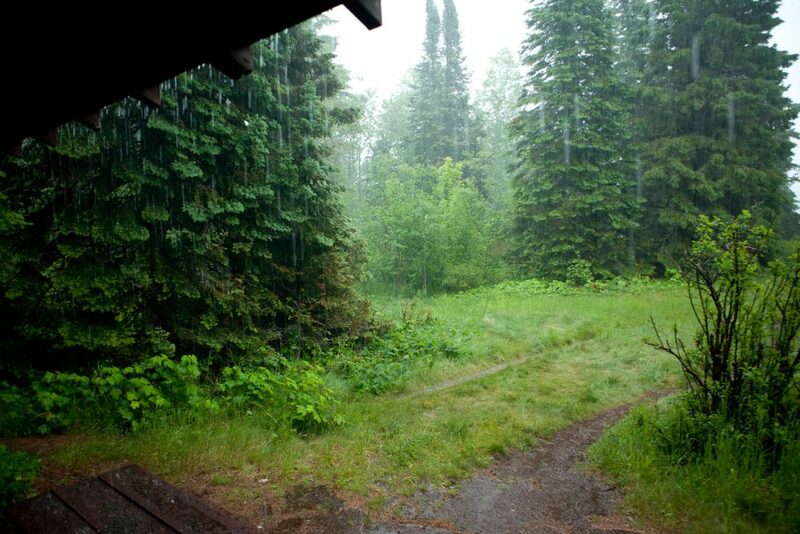 I’ve been on Isle Royale twice in July, and both times I had a lot of rain during my trips. The busiest season starts in the second half of July and lasts till September. This is when you can expect a lot of people, and you need to go to remote campgrounds to find some solitude. September and October, might bring you some mild weather, but can also bring some miserable one, too. The advantage though will be definitely fewer visitors on the island. Hikers on the trail at Moskey Basin. Both times, when I went to Isle Royale, I took a ferry from Copper Harbor. 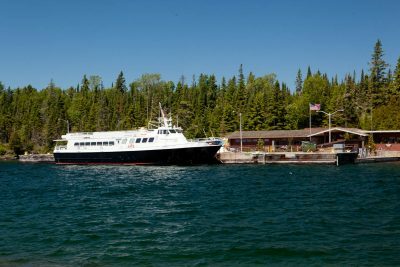 The ferry, Isle Royale Queen IV, departs Copper Harbor at 8 in the morning, so you need to be in Copper Harbor a day before. The town has many accommodations – hotels, motels and campgrounds. Therefore, finding a place to stay overnight should not be a problem. Ferry ride to the island can be pretty smooth in calm weather, but it also can be rough, if the lake is up. When I went this late June, the weather was fairly nice, so the ride was relatively smooth, but still there were few people who went on the open deck and stayed there the whole time, despite the cold outside. So, one remark here about the weather on the lake. 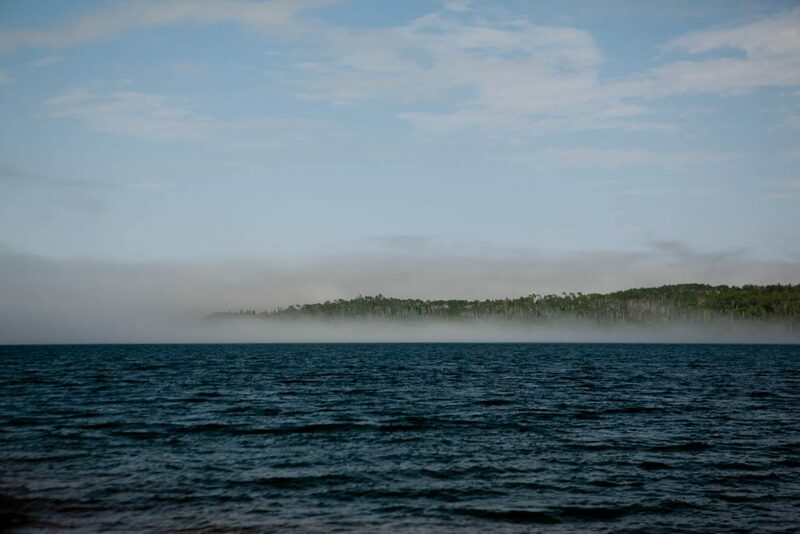 Even though it was pretty warm (about 70 F (21 C)) in Copper Harbor in the morning, as soon as the boat got on an open water, the temperature outside dropped significantly because of the still cold at this time lake (water temperature 38 F (3 C)). Therefore, if you want to stay on the deck, bring a jacket with you, and wear long pants. Once we got to Rock Harbor, it was about 80 F (27 C) degrees. When you board the ferry, they ask you to remove fuel containers and put them in a milk crate for the ferry ride. It is a good idea to mark yours with a permanent marker, as there might be few similar ones in the crate. They want people to remove their hiking and fishing poles from their backpacks, to protect people loading/unloading the luggage. In the late spring, summer and early fall there are enough people going to the island, that ferries get full. Don’t expect to go on it without an earlier reservation! 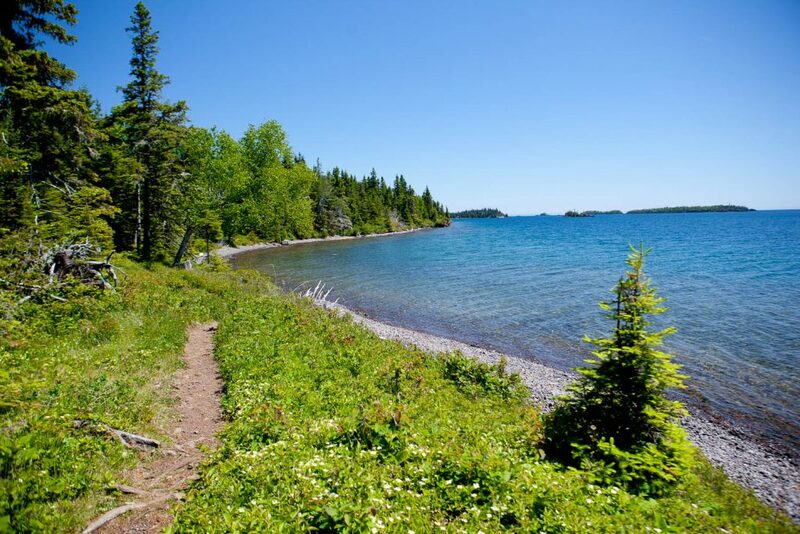 Isle Royale is a national park, so like in many other national parks, you need to get your permits. However, first you need to go through Ranger orientation. Since some of the people, who arrived with you on the island, are staying at the lodge in Rock Harbor, there are two orientations. One – for backpackers. Another one – for tourists staying at the lodge, or camping in Rock Harbor, and day visitors. The ranger practically goes over the hiking/backpacking information that can be found online, on the park’s pages. They include information about permits, backcountry facilities, ranger presence, leave-no-trace policy, animal encounters, etc., etc. Right after, you can get your permit. This is officially called an “Entrance Fee”. It is $7.00 per day, or $60.00 for a season pass (2018 prices). If you are coming as a part of the group, it might make sense to get the Season Pass. It covers the person, whose name appears on it, and 3 additional adults traveling with the pass holder. If you are coming alone and only for 8 days or less, and not planning on returning to the island again the same year, it makes sense to pay the daily entrance fee. When you pay the entrance fee, you also fill out a hiking permit, where you specify your intended route. You can change it, as you hike. The rangers just ask, that you update it, if you change the route, and return the permit to them, before you leave the island. Once you have the hiking permit, you are all set to hit the trail. One mention here. In Rock Harbor, and also in Windigo, there are stores where you can buy some food and beverage, and also some park related gifts and trinkets. Below, described in details, is the hike that I took from Rock Harbor to Daisy Farm, to McCargoe Cove, to Moskey Basin, then back to Daisy Farm, and then to Rock Harbor. It was a 5-day backpacking trip, visiting some of the more popular spots in the eastern part of the island. The trail out of Rock Harbor going west enters spruce forest and is pretty smooth and flat. Soon it leads towards the lake and follows the shoreline. It gradually becomes more of an “R&R” trail, or “rock & root”, with occasional short incline here and there. To the left, across the water you get to see many of the smaller islands surrounding Rock Harbor. The trail stays close to the shore and occasionally passes through rock outcroppings, which usually require some short climbs. In about a mile and half you pass a trail sign for Suzy’s Cave. Then, after another mile or so, you reach Three Mile Campground. The campground is right off the trail. You actually pass by some of the shelters. Being close to Rock Harbor, it is usually full, in season. 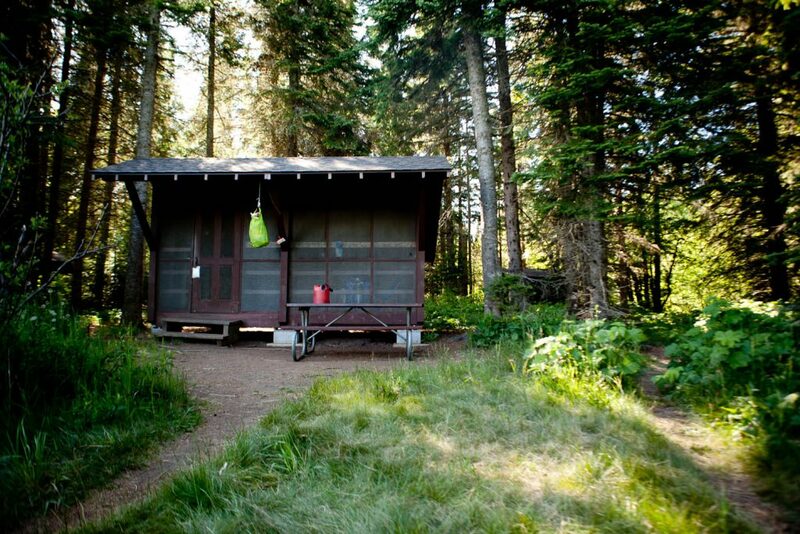 Shelter in Three Mile Campground. Picture taken from the Rock Harbor Trail. When you continue on the trail and pass the campground, you arrive at a junction with Mount Franklin trail. To continue to Daisy Farm Campground, you need to keep going west on Rock Harbor Trail, which keeps following the shoreline. In about 2 miles you reach the Siskiwit Mine. The final 2.4 mile stretch to Daisy Farm is pretty flat. Siskwit Mine at Rock Harbor Trail. Expect to see fairly good number of backpackers and day hikers on this section of the Rock Harbor Trail. 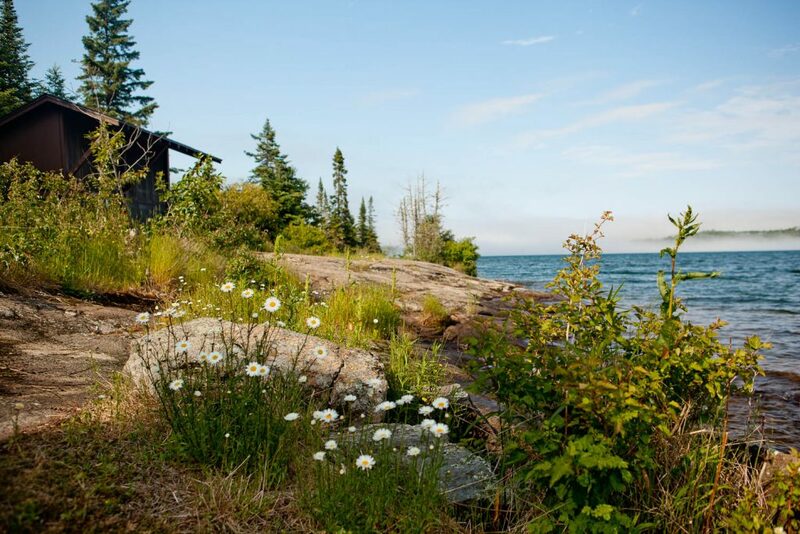 It is close enough to Rock Harbor, that many people staying at the lodge will venture as far as Daisy Farm on a day hike. 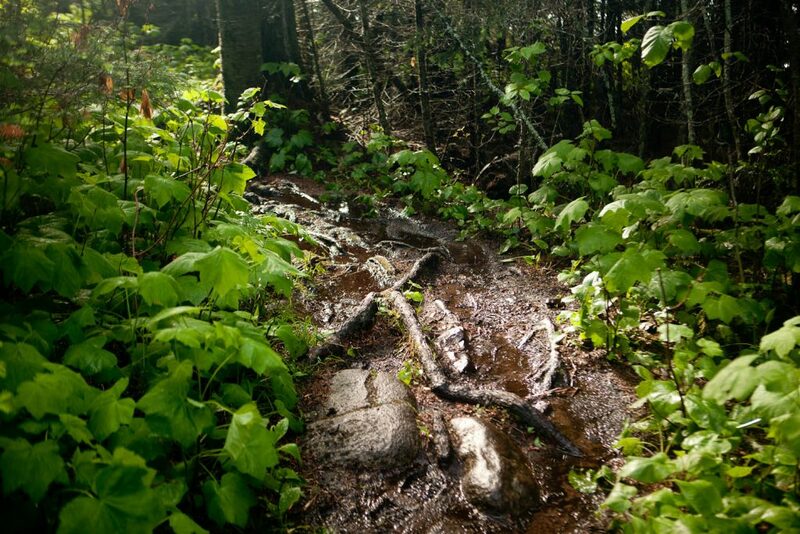 The trail is fairly easy and pretty scenic, however, it can be pretty wet and muddy during and after rain, especially, after few days of rain. Shelter in Daisy Farm Campground. The Daisy Farm campground is located right at the shore. 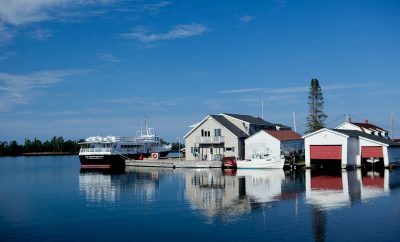 Again, because of its proximity to Rock Harbor and the fact that it is located on one of the major trails crossing the island in the east-west direction, it is very popular. However, if you get there in the early to mid-afternoon, you still should be able to find camping spot, and even a shelter. My first day on the island was nice and easy. The weather was perfect. The hike was pretty easy. The trail was not too busy. I just ran into few people on my way to Daisy Farm. The campground itself got quite busy, but still not completely full, by the evening. The dock at Daisy Farm Campground. The trail, just past the center of Daisy Farm Campground, splits into Rock Harbor trail continuing southwest to Moskey Basin, and Daisy Farm trail going northwest, into the woods towards Greenstone Ridge Trail. 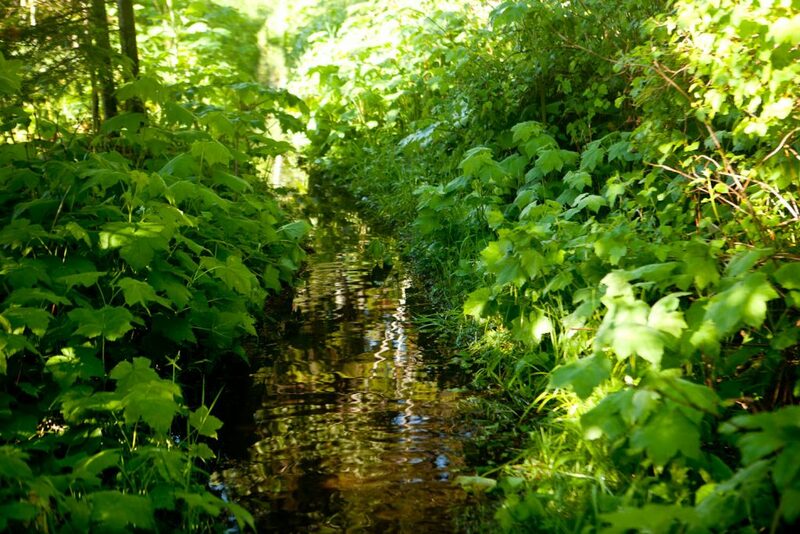 To go to McCargoe Cove, you need to follow the Daisy Farm Trail. The trail goes along Benson Creek for a little bit, and then climbs over the western side of Ransom Hill. Shortly, you end up crossing the swamp, which has, in the low areas, elevated boardwalks. When I was there (summer 2018), many of them were in pretty bad shape. Rotten boards, often loose, and therefore unstable. It was easy to lose balance with a heavy backpack, and end up in the muck. I noticed though, that in some places there were stacks of new boards stored and waiting to be installed. So hopefully soon, the conditions of those boardwalks will improve. After you pass the swamp, you continue through the forest. Soon, you cross another swampy area. Then you begin a gentle climb towards the ridge, and when you are about 2 miles from Daisy Farm Campground, you reach Greenstone Ridge Trail. You follow the Greenstone Ridge Trail southwest. Soon you go over small hills. On one of the hills, when you climb the rocky outcropping, you are rewarded with amazing view to the north. Unfortunately for me, when I got there, the sky got quite dark and it was obvious that the storm was coming. I ran here into two guys that I’ve seen few times ahead of me beginning shortly after I left the campground. They were also going to McCargoe Cove. However, later they planned on taking Minong Trail all the way to Windigo. They soon left. I took some pictures and shot video and got back on the trail. Trail began a gradual descent, and after a while began to climb again. At one point your reach the elevation of high point on the ridge at 934 feet. Then, you descent again and cross some swamps. Now, I was hiking in the rain already. It started shortly after my last break at the scenic rock outcropping. 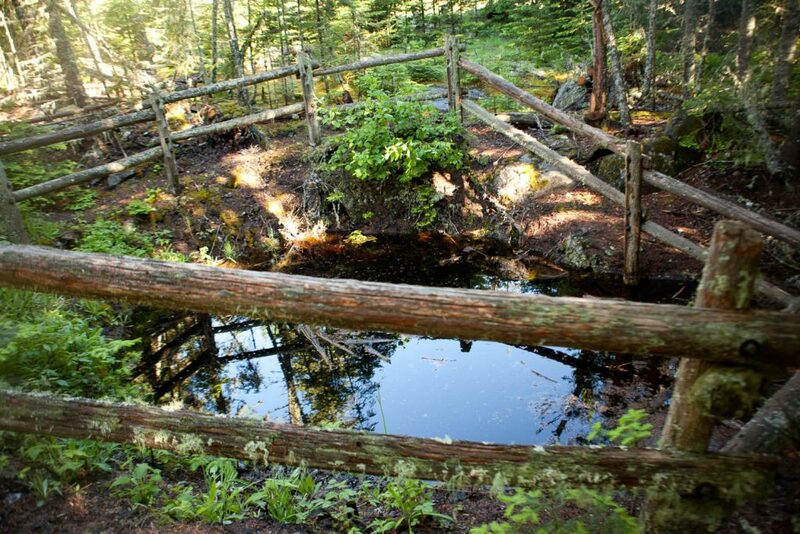 When crossing the bogs, the elevated boardwalks were wet and lose in many spots because the wood rotted around the nails. The lose boards would rotate sideways without any warning. There were few spots where I lost balance. 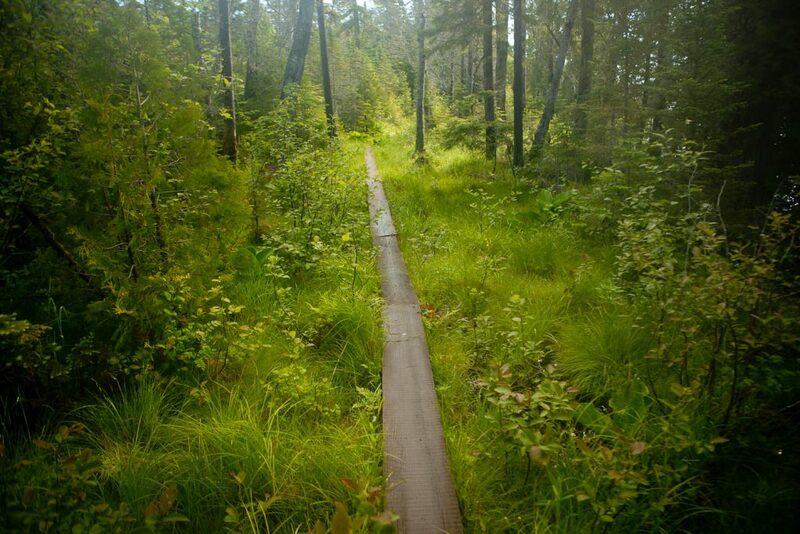 Boardwalk – a typical view in the low and wet areas on many trails on the island. Occasionally, when you cross some uneven, descending or ascending smooth rock, it can also be slippery, so bringing the hiking poles would make sense. Unfortunately, I was carrying my heavy photographic and video gear, and chose not to carry the poles because they would be in a way any time I wanted to shoot. But now, at times, I had to thread really carefully, and even though I did, I fell twice. 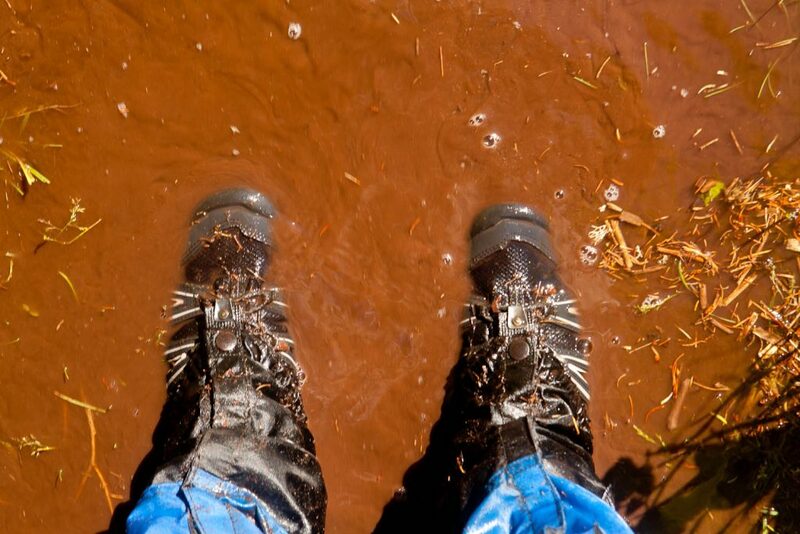 While it is not fun trying to get up with an almost 50-pound backpack, while you rolling in mud and rain water, that is not the real issue at stake. The biggest concern is that during such fall, you might get injured and not be able to continue. 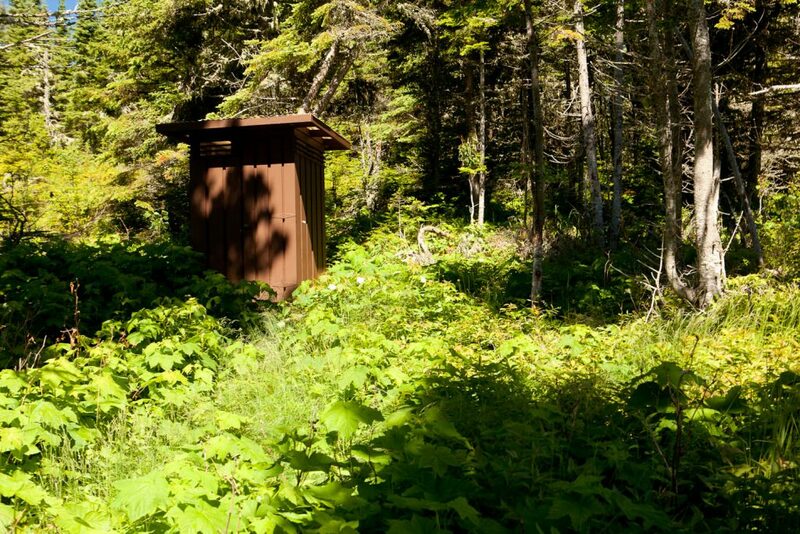 So, my advice here is that if you go to Isle Royale, bring the hiking poles with you. You will be glad you did, especially when it rains. When you get close to the Chickenbone Lake, you begin another ascent. At one point, the trail will make a 90 degree turn to northwest direction, the path ascends down, and soon you reach junction with East Chickenbone Trail. At this point Greenstone Ridge Trail turns west again, and East Chickenbone Trail continues north for 2.1 miles to McCargoe Cove. The East Chickenbone Campground is just few hundred feet ahead. When you pass the campground, the trail descents down and goes around the lake. Shortly after, you cross few bogs, then you hike around the pond. Then, you are going up and down for a while. 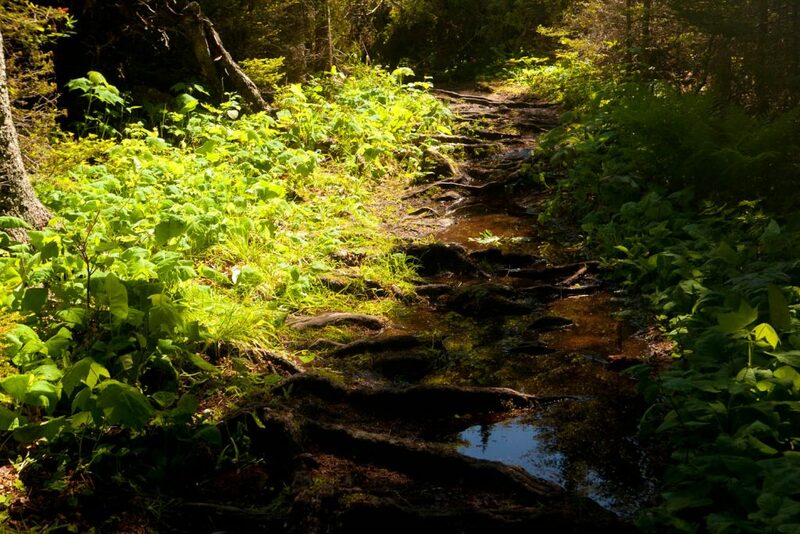 When you finally cross Chickenbone Creek, the trail climbs towards the junction with Indian Portage Trail. From the junction you are only 0.5 mile from the campground. McCargoe Cove Campground is far enough from Rock Harbor, that it usually is not too crowded. Although, when I was on the island in mid-90’s, the campground was full, and ran out of spaces to accommodate late-comers. However, during my 2018 trip, even though it was beginning of July, there were only four different parties here, including myself. Maybe it was because of the weather. It was continuously raining since the mid-morning. I was happy, that I was able to find a shelter, so I could dry my clothes and gear, and prepare food under a roof. It eventually stopped raining, and the evening was cloudy, but dry. Then at night, few storms rolled over the island, and we even got quite intense thunderstorm for a while. 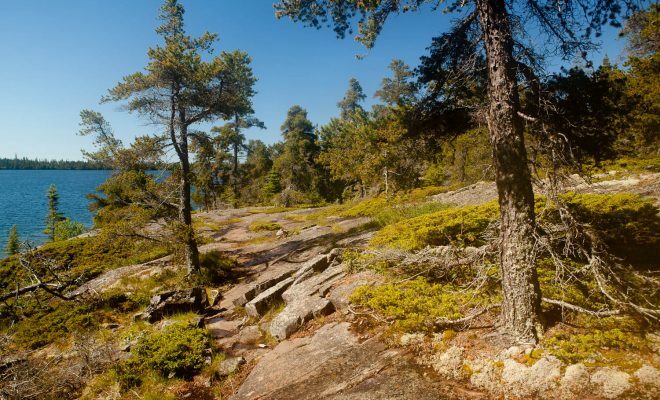 The Indian Portage Trail going from McCargoe Cove has some ups and downs in the beginning. You hike along Chickenbone Creek, but on a ridge, so the creek itself is most of the time out of sight. Eventually, you get to the end of the northern arm of Chickenbone Lake, and you follow it to West Chickenbone Campground. The campground is situated right on the lake. From there trail departs the lake and steeply climbs for a short while and climbs the ridge. Soon you reach a junction with Greenstone Ridge Trail. After the junction the trail drops rapidly. Later, the trail undulations are more gradual. You pass some low area by Lake LeSage and continue towards Lake Richie. For a while it follows the shoreline offering some nice views of the lake. When you get close to the northeastern side of the lake, you reach the campground. Short distance past the Lake Richie Campground you arrive at the junction with Lake Richie Trail. From here you follow Lake Richie Trail east all the way to Moskey Basin. You go through woods, bogs, and climb some solid rock, only to descent into woods again. After almost two miles, you finally arrive at the little trail spur that takes you to Moskey Basin Campground. In the morning it was a difficult decision whether to stay or go. The sky looked like it might start raining anytime. I packed my gear, and after quick breakfast left the campground, hoping that I can get to get to Moskey Basin before the rain. The fact that it did not rain during my hike didn’t matter much. There was enough of high vegetation along the tight (most of the time) trail, that I was soon pretty wet. Rock Harbor Trail between Moskey Basin and Daisy Farm. When I got to Moskey Basin Campground in early afternoon, the shelters were empty. After a group of scouts left the group site, I was there alone for a while, when eventually some other hikers began to show up. It was nice to have a shelter and be able to partially dry the wet clothes, boots, and not to have to worry about possible rain. The shelters are right along the shoreline and offer great views of Moskey Basin and the peninsula on the opposite side of it. Evening and the night were dry, but it was still cloudy and it looked like you could expect more rain in the future. The hike to Daisy Farms starts through the woods. But soon, you begin hiking over rocky crests, and it will be like that almost all the way to Daisy Farm. There are few times, when the trail descends down into the woods, only to climb another rocky ridge. Close to Daisy Farm, the Rock Harbor Trail junctions with Daisy Farm Trail, and from there it is only 0.2 mile to the campground. I wasn’t lucky today. I left the Moskey Basin in the morning when it was pretty cloudy, but not raining. However, about half an hour into the hike the rain started. First, it was light, but then it gradually grew stronger, and by the time I reached Daisy Farm, it was pouring. Luckily, again I was able to find an empty shelter. I quickly changed and hang wet clothes up, inside, of course. Outside it was still pouring without any sign of stopping. Fog covered peninsula on the other side of Moskey Basin. Same, as three days ago, Daisy Farm was pretty busy, but not completely full. However, that could be attributed to the weather, as it was raining pretty much most of the day. Pouring rain. Picture taken from inside the shelter at Daisy Farm Campground. This was my last day on the island. I had to be on a ferry going back to Copper Harbor in the afternoon. Luckily, it stopped raining at night. However, the trail was completely soaked, and actually at many places there were streams of rain water running along the path. Occasionally, you had room to hike around, but most often the trail is surrounded by bushes and small trees, and those were still pretty wet. When you brushed against them, you got soaked. So, probably half hour into the hike, I stopped trying to keep my boots dry, and just walked through all, even deep puddles and mud. Only the higher areas, when the trail crossed some rock outcroppings did not have deep water, but then they were slippery. Muddy trail Rock Harbor Trail after few days of rain. I made it to Rock Harbor around 11 AM completely soaked again. Luckily, I had some dry clothes to change for my ferry ride back to mainland. In Rock Harbor I ran again into two guys that I met on the way to McCargoe Cove. They were planning on going to Windigo, but realizing that the weather is not going to change much and they could expect more rain, and the fact that west of Todd Harbor, there are no shelters, they decided to give up the idea of going to the other end of the island. Standing on the flooded Rock Harbor Trail. It was nice to be back on the island after over 20 years since my first visit. A lot has changed. Many campgrounds are a lot more overgrown with vegetation. There are many people visiting the island, but not as many backpackers, as in the past. There are probably not as many moose on the island, as there were in the mid-90’s. Back then, I saw moose every day, at least once. This time, I just got two brief glimpses. Back in the 90’s there were foxes roaming freely in campgrounds coming to people looking for food. I did not see those anymore during this trip. The weather is very unpredictable. And, I think that if you are going for more than just a day or two, you can expect rain, and you should consider it in your planning. It is a good idea to bring with you something to read, since you might be stuck in a tent or shelter for hours in bad weather. Trail after few days of rain. The bugs are not a problem. At least what I had experienced during my two trips and staying at shoreline campgrounds. There were very few mosquitoes. So few, that I have never used any bug spray. 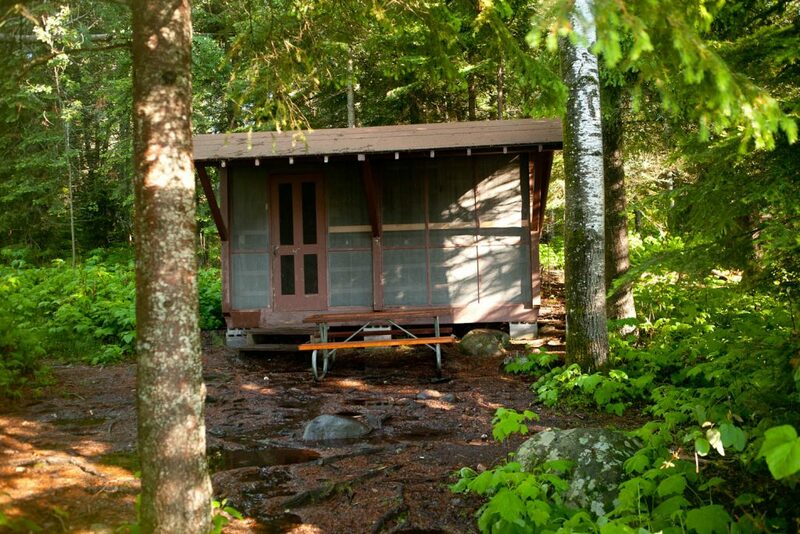 However, I have heard of people going to some inland campgrounds, where mosquitoes were horrible. The island has plenty of standing water, so I think at some locations they can be bad. Therefore, I would recommend bringing some bug spray and head net. The island is still a wilderness, and you should treat it with respect. The hiking there is not the easiest. 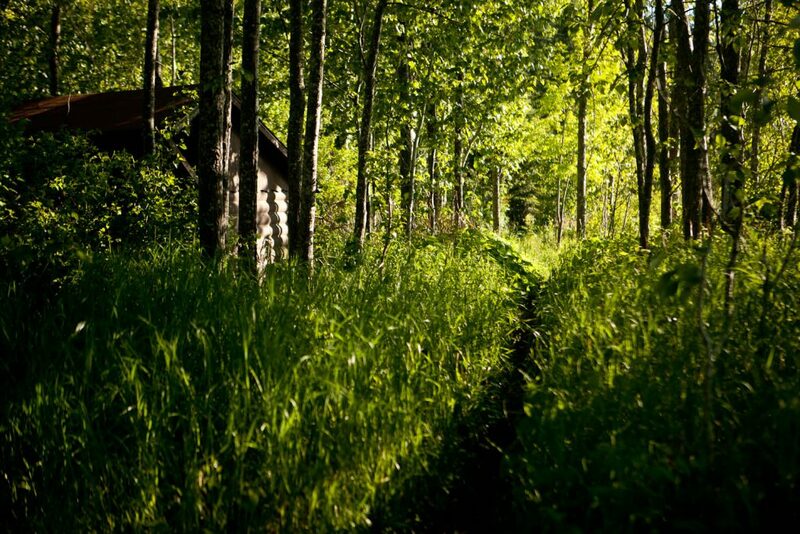 The trails are not your nice, wide, smooth paths passing through the woods. They are solid rock in places, sometimes without cairns, and you could easily get lost. When they go through the woods, they are often rocky with tree roots sticking through, which makes footing unstable, slippery at times. I don’t think, you should make the island a place for your first backpacking trip. There are few reasons behind it. One, it is a remote location. If anything goes wrong, it will take a while to get evacuated, or to get medical help. Two, if you decide that is not for you, or that you want to make a trip shorter, it might not be that easy. You have a reservation for your return trip, and you might not be able to change it. On the other hand the island is a remarkable and unique place to visit. If you love nature, if you are experienced backpacker and have never been there before, you need to go. 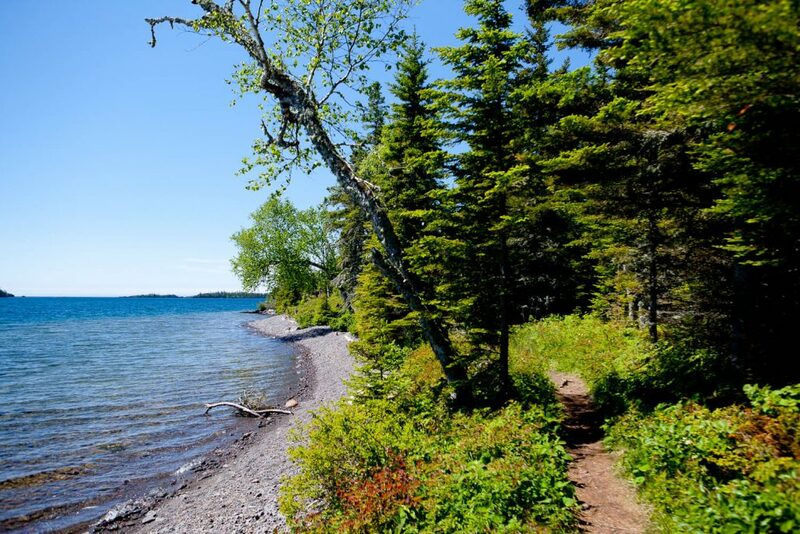 You should go backpacking on Isle Royale! 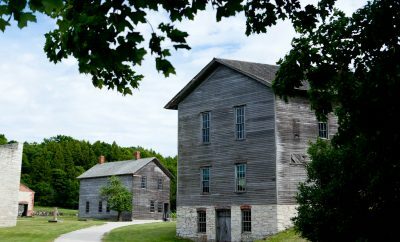 To find out more about Copper Harbor, accommodations there, dinning and some local attractions, read my post: Visiting Copper Harbor in Michigan’s Upper Peninsula. 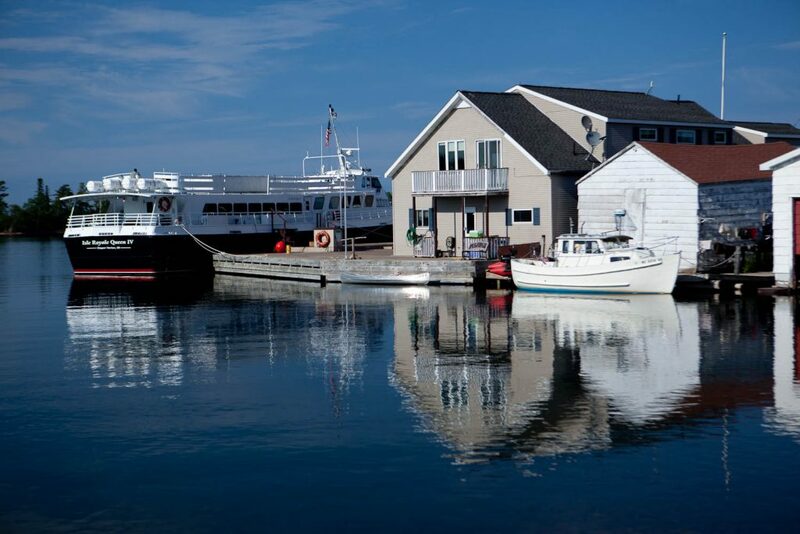 The ferry at the dock in Rock Harbor.